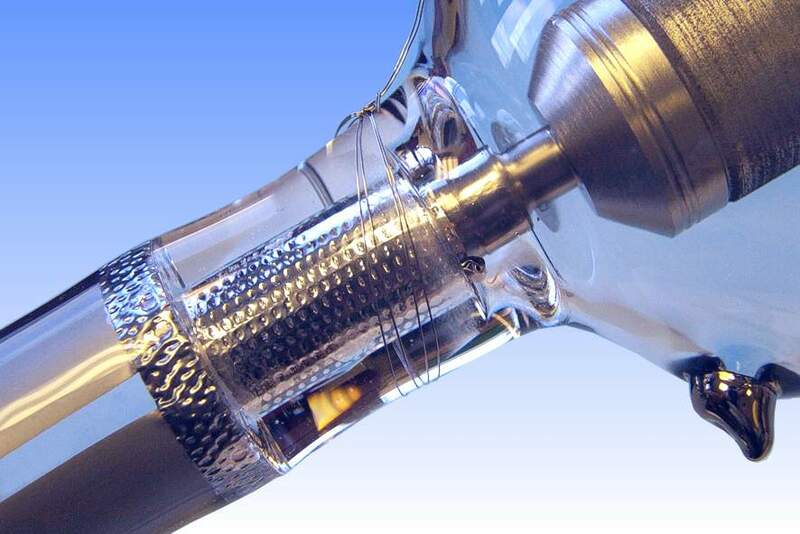 HBO and ME lamps are extremely high intensity short arc mercury sources, operating at around 75 atmospheres pressure. The high power dissipation across the very short arc (3500 watts across a 4.5mm gap in this lamp) results in a temperature of around 10,000°C, exciting mercury atoms to much higher levels than usual. 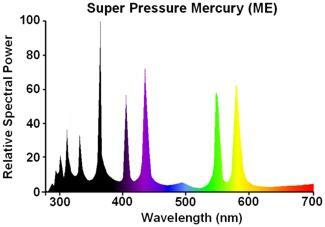 Under these conditions a high efficiency source of large amounts of ultra-violet radiation is produced, with around 10-15% of the lamp input power being radiated below 380nm. 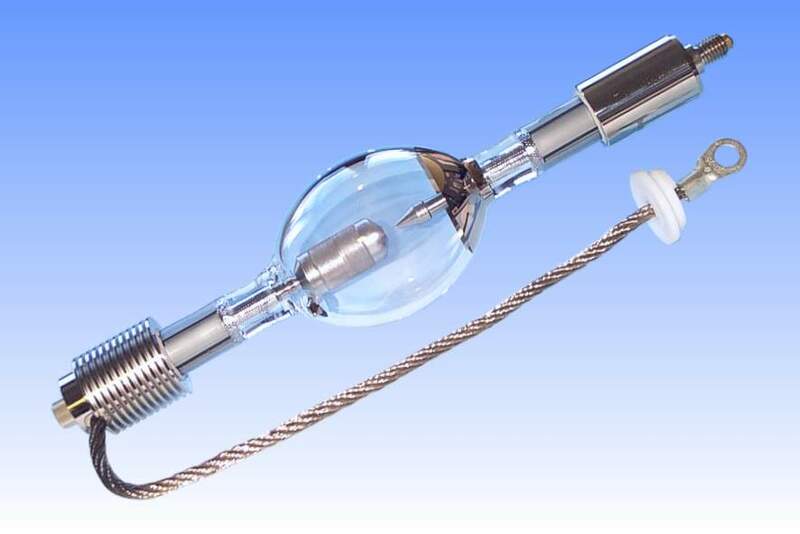 Larger lamps find applications for the photolithographic processes in semiconductor production.The discharge vessel is ellipsoidal in shape and fabricated from the highest purity optical quartz glass. It contains low pressure argon (for ignition) and a quantity of mercury which is completely vaporised at the operating temperature. 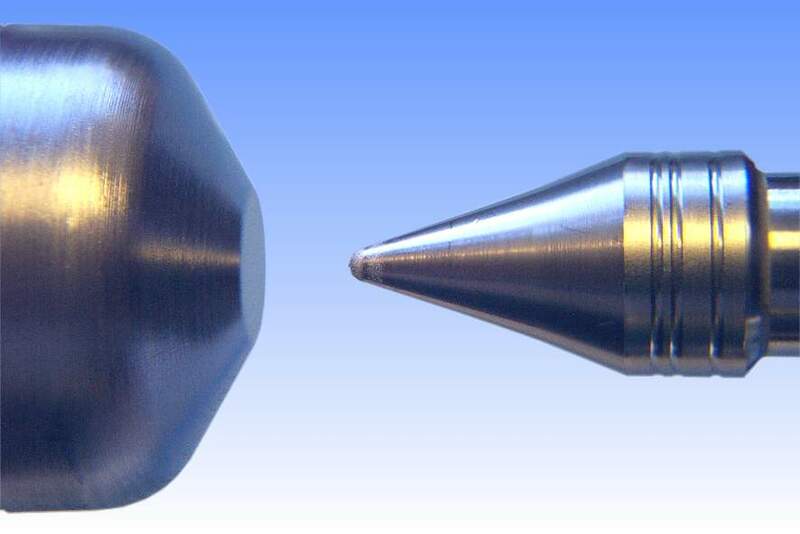 The majority of lamps are intended for DC operation thus the electrode sizes are dissimilar. The cathode is small so that the high temperature required for good electron emission is achieved. By contrast the anode must be very large to allow for sufficient dissipation of the heat generated by high energy electrons entering the tungsten. The profiled surface of the electrodes aids ignition and a small coil of tantalum wire behind the cathode acts as a getter to adsorb residual gas impurities, while a coating of platinum on the bulb behind the cathode prevent condensation of mercury in this area. Seals are of the multi-foil type with four moly foils each. HBO lamps do not generate ozone, because owing to the self-absorption in the cooler outer arc regions, radiation below 240nm is trapped in the discharge. However during run-up before pressure increases, some ozone is produced. 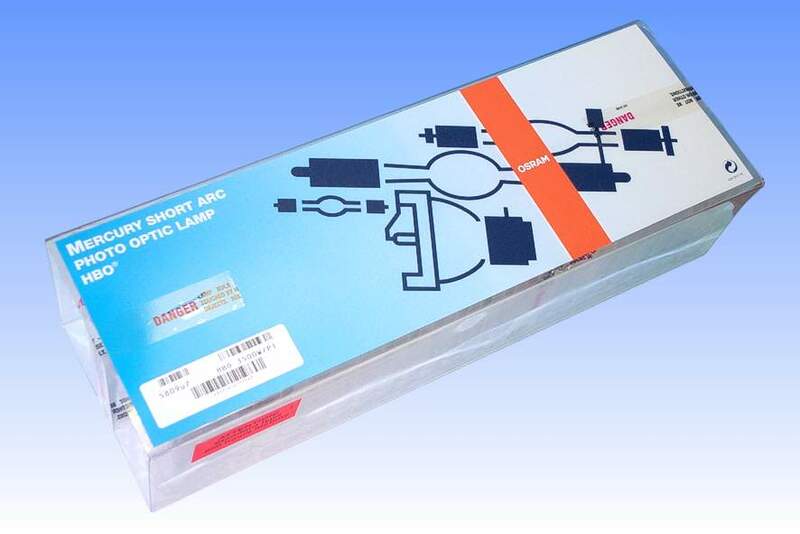 References: 1) Osram Lichtprogramm 2002/2003. 2) Osram "HBO Lamps and their App. lications" Brochure, 1993.